The San Juan Islands are one of the most beautiful natural areas in the world. Located roughly 60 miles north of Seattle in the Puget Sound, the San Juans are a hidden treasure that all should experience. With moderate temperatures and very little rain during the summer months the weather is as near perfect as you can get. 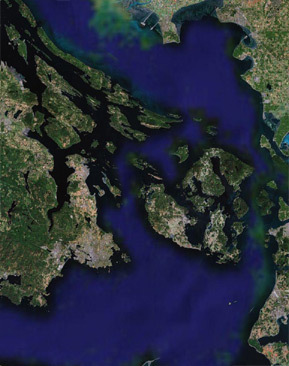 The calm waters of the San Juan Islands make it an ideal place for boating. The islands are abundant with wildlife and orca whales are among the most amazing. The waters surrounding San Juan Island are home to these exceptional animals May-September. Departing from Friday Harbor, on San Juan Island, allows us to get to the areas that the Orcas frequent the most (notably the "west side" of San Juan Island) with great ease. Boating in the San Juan Islands is such a special adventure that everyone should have a chance to experience at some point in their life. So, leave the city life behind and try a little "Island Style".